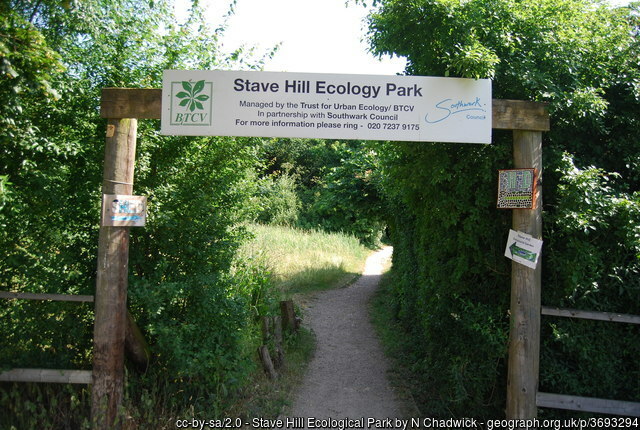 Police investigating a robbery in the Stave Hill Ecology Park have made an arrest. The 22-year-old man was arrested on suspicion of robbery in the early hours of Thursday 7 June. He was taken into custody at a south London police station and later bailed pending further enquiries to a date in late June. The arrest follows an incident that occurred at around 11.25 on Friday 1 June near the Trust for Urban Ecology building in the park. Two women, aged 37 and 40, were walking with their children through the park when they were robbed of their phones at knifepoint by two males. During the incident one of the women was stabbed in the hand. A man, aged 49, who came to the assistance of the victims, also received a stab injury. The two males suspects fled on foot through the woods following the incident. The two injured people were taken to hospital for treatment and have since been discharged. “This was a shocking and brazen attack in broad daylight which resulted in two people receiving stab injuries and a number of children being terrified,” said Inspector Owen Pyle, who is in charge of neighbourhood policing in Southwark. “While we have made an arrest, our work remains ongoing to ensure those responsible for this abhorrent crime are brought to justice. “There will be increased police patrols of the area over the next few weeks in the run up to the summer holidays, particularly around school start and finish times, to reassure residents and deal with any issues. Anyone with information about this incident is asked to call Southwark Police on 101 quoting ref: 2786/1Jun. Alternatively, contact Crimestoppers on 0800 555 111. Local residents concerned about recent apparent increases in crime and antisocial behaviour in SE16 have organised the Canada Water Reclaim March on Sunday 24 June, starting at Stave Hill. A new one-way system around Thurland Road and Old Jamaica Road came into force this week. As Canon Gary Jenkins, vicar of St James’s, writes on his blog: “It all began when a child from St James’s school was hit by a car on their way home from school. “Then school governors, councillors, and the traffic planners at Southwark put their heads together. More details in the official documents here. A man who conducted a campaign of fear against a member of staff at Surrey Quays station has been jailed for more than two years. 37-year-old Patrick McFetridge from Druid Street threatened and intimidated the worker at Surrey Quays station nine times between November 2017 and February 2018, including racially abusing them, swearing at them and making threats to kill. During his three-month scare campaign, McFetridge told the member of staff he would cut their face and come after their family. He also urinated on the counter while the victim was stood behind it, which required specialist cleaning afterwards. McFetridge was arrested and later charged with putting a person in fear of violence and criminal damage, which he denied. 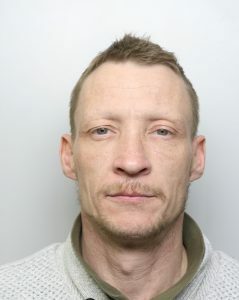 Following a trial he was convicted of the offences and on 18 May he appeared before Blackfriars Crown Court, where he was sentenced to 30 months behind bars. He was also handed a five-year restraining order and a Criminal Behaviour Order banning him from Surrey Quays station for five years. Detective Constable Richard Rowe, from British Transport Police, said: “For no reason at all, McFettridge targeted this member of staff, leaving his victim fearing for their life. Last month we reported that British Land had submitted its planning application to Southwark Council for the Canada Water masterplan, covering Surrey Quays Shopping Centre, the Printworks and the leisure park. Now the application – comprising 209 documents – is live on the Southwark planning register. 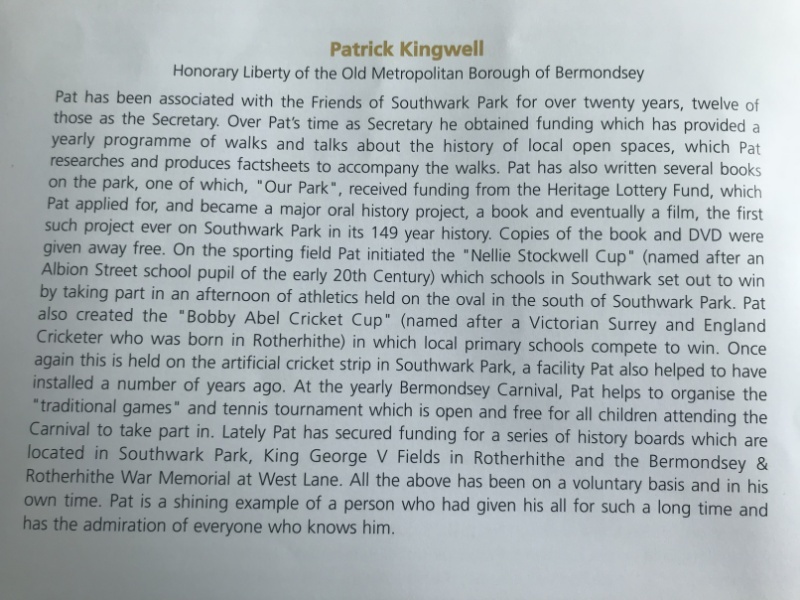 At the Southwark Civic Awards on Monday night the Honorary Liberty of the Old Metropolitan Borough of Bermondsey was awarded to Patrick Kingwell, latterly secretary of the Friends of Southwark Park. 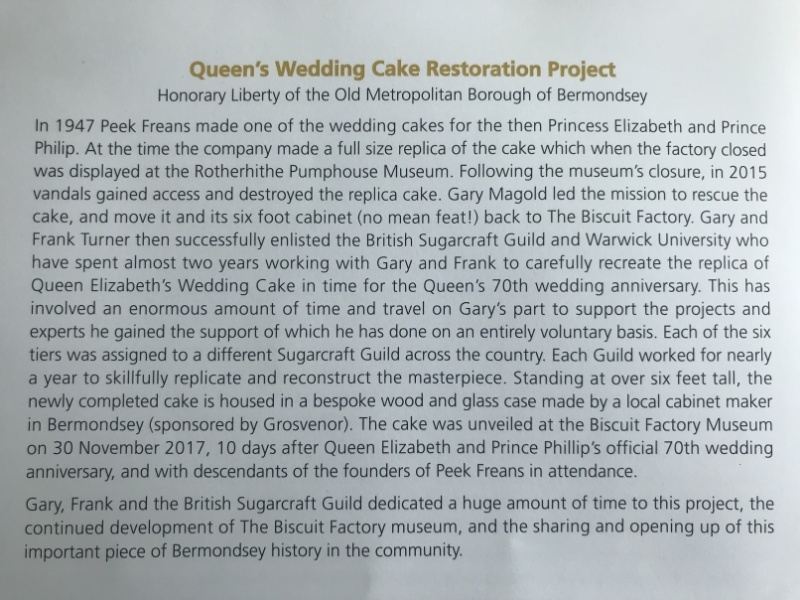 The same honour was bestowed on the team behind the restoration of the Queen’s Wedding Cake. Posted in Charities, History, Politics. Do you have financial expertise? 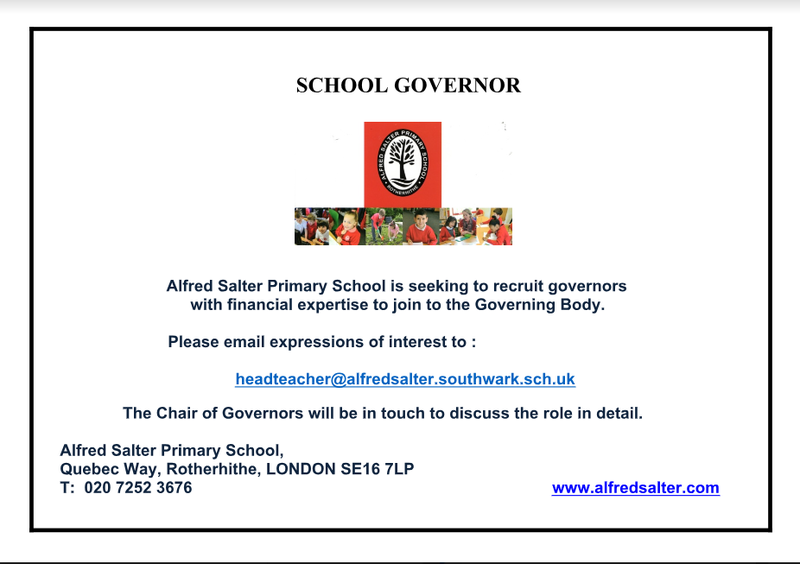 Could you help a local school? These new images show how Canada Water could look if British Land’s major planning application gets the go-ahead. 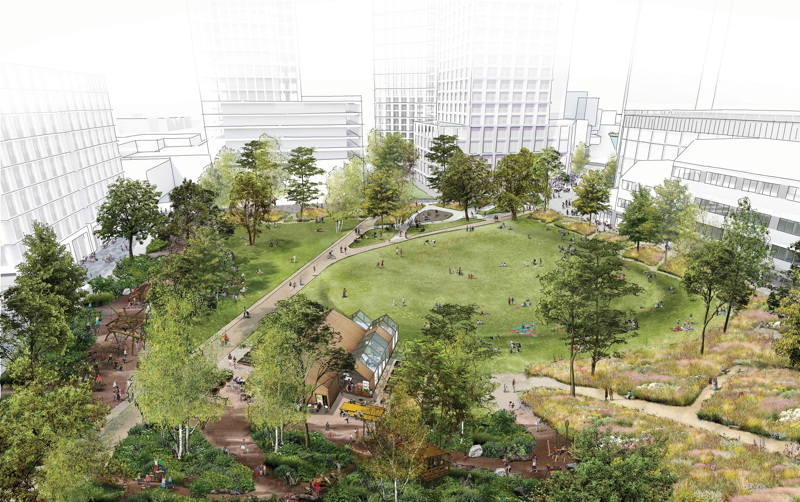 British Land has entered into a Master Development Agreement with Southwark Council and submitted an outline planning application for the Canada Water Masterplan. The outline submission also includes a detailed planning application for the project’s first three buildings, which include workspace, homes (of which 35 per cent will be affordable), retail and a new leisure centre. The first three buildings are located on parts of the site which are currently overflow car parks for Surrey Quays Shopping Centre alongside the edge of Canada Water itself, as well as the vacant site at Robert’s Close. Subject to planning approvals, construction of the first aspects of the masterplan could begin in spring 2019. 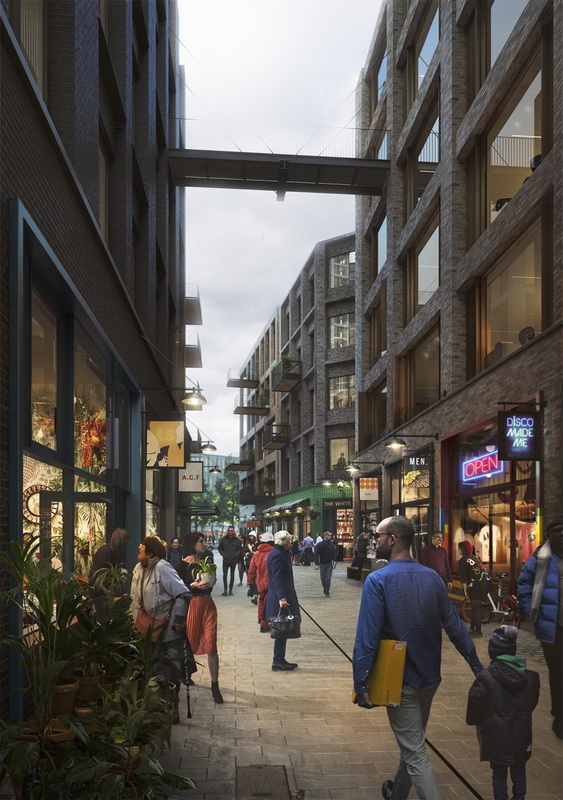 The Master Development Agreement provides a framework for delivery of the Masterplan, pools Southwark Council and British Land’s freehold and leasehold interests across the site and allows a new 500-year lease to be drawn down. This agreement also confirms the local authority’s stake in the project, and their right to invest up to 20% in each forthcoming plot; the agreement also confirms the location of a new leisure centre as part of the proposals. 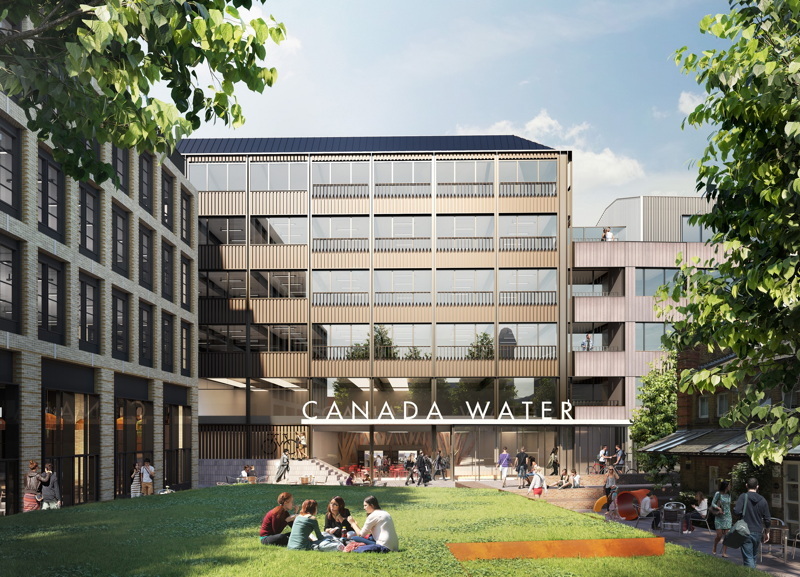 Roger Madelin, Head of Canada Water Development, British Land, said: “We are delighted to have entered into a Master Development Agreement with Southwark Council and submitted our planning application for the Canada Water Masterplan which marks an important milestone in the delivery of this project. 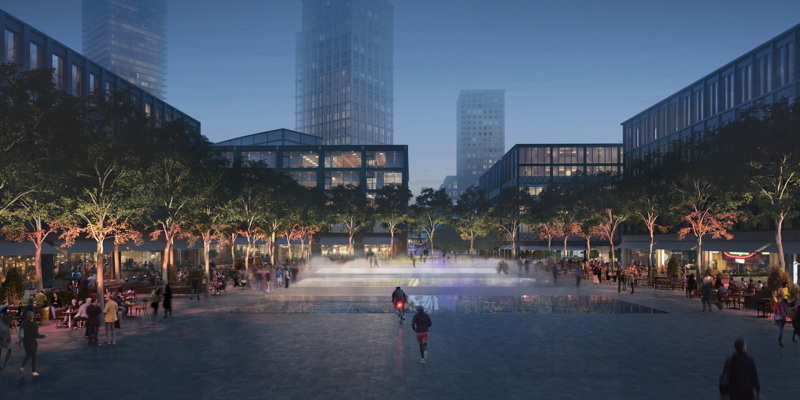 “Drawing on our experience of creating vibrant, mixed-use places across the capital, this major urban centre at Canada Water will provide an exciting place to live, work and visit, delivering high quality design, active spaces and significant economic and social benefits for the local community. Cllr Peter John, leader of Southwark Council, said: “It is fantastic to see this project moving forward. British Land have done great work to consult and engage with local people and the resulting Masterplan will deliver what local people want to see, including a guaranteed 35 per cent affordable housing split 70 per cent social rent and 30 per cent shared ownership in the first phase, new retail spaces and job opportunities, education and health facilities and a brand new leisure centre. “In addition British Land, in conjunction with the council, has committed to a Social Regeneration Charter which will ensure that the lives of existing local residents will be improved by the project which we believe to be a first for a project such as this. The planning application has not yet been ‘validated’ by Southwark Council and the documents should be available on the council’s website in the next few weeks. On Wednesday a Transport for London committee will consider a report on the proposed walking and cycling bridge across the Thames between Rotherhithe and Canary Wharf. You can read the committee report here. “The Rotherhithe to Canary Wharf crossing will provide a much needed new cross-river walking and cycling connection between the two key areas of London; Rotherhithe in my constituency and Canary Wharf, which between them are expected to accommodate over 36,000 new homes and 112,000 new jobs by 2030. That is a huge number and better connections are urgently needed to match growth,” said Florence Eshalomi, London Assembly member for Lambeth and Southwark. “The next stages will see TfL considering further options for landing points, opening and operating mechanisms, height and access arrangements. I am very pleased that TfL are determined to ensure that the development process for this scheme is transparent and robust, building on the lessons learnt from the Garden Bridge. The public will be able to feedback again during the second public consultation in the summer and I look forward to seeing further responses to this fantastic project. London Bubble has asked us to share details of their adult drama group which meets Wednesdays, 7-9pm at 5 Elephant Lane, Rotherhithe, SE16 4JD. “At Bubble we create a friendly, supportive, creative atmosphere for people to build skills* and make theatre about the things that are important to them. People come to this group come from all walks of life and have a wide range of experience. London Bubble’s terms run April-July, Sept-Dec, Jan-Mar and costs £80 (£40 concessions) per term. You’re welcome to come for a free taster class to see whether the group is right for you. Or, why not join Bubble for this term’s short performance on Wednesday 4July. More info and a short film about the group here. After Thursday’s elections the political scene in SE16 is not much changed, with Labour and the Liberal Democrats each holding on to the territory they already had. Overall, we now know the results for 60 out of the 63 seats on Southwark Council, with the final three councillors (in London Bridge & West Bermondsey) to be elected next month. Until the residents of that last ward cast their votes, there are 49 Labour councillors and 11 Lib Dems.